Ground-based telescopes have long struggled to achieve the image clarity and resolution of their orbiting cousins due in large part to atmospheric distortions. That's why we build observatories on mountain tops: to minimize the amount of atmosphere between the telescope and incoming starlight. But with the help of a cutting-edge adaptive optic system, astronomers are getting an unprecedented and undistorted look at deep space sans the perilous rocket launches. The Gemini observatory in Chile operates a pair of 8 meter optical telescopes. After a decade of research and development, the multinational research station recently installed the GeMS (Gemini Multi-conjugate adaptive optics System) in its South telescope with spectacular results. “What we have seen so far signals an incredible capability that leaps ahead of anything in space or on the ground — and it will for some time.” said Robert Blum, Deputy Director of the National Optical Astronomy Observatory. GeMS employs a series of five laser star guides and a trio of deformable mirrors (collectively called Multi-Conjugate Adaptive Optics, or MCAO) to eliminate these distortions. 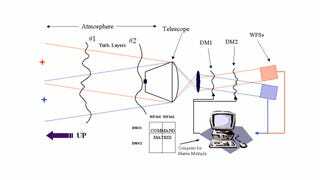 Adaptive optics technology requires a frame of reference to calibrate its imaging systems and typically use a set of bright stars as reference points. Unfortunately, these guide stars aren't always visible in the observed patch of sky. 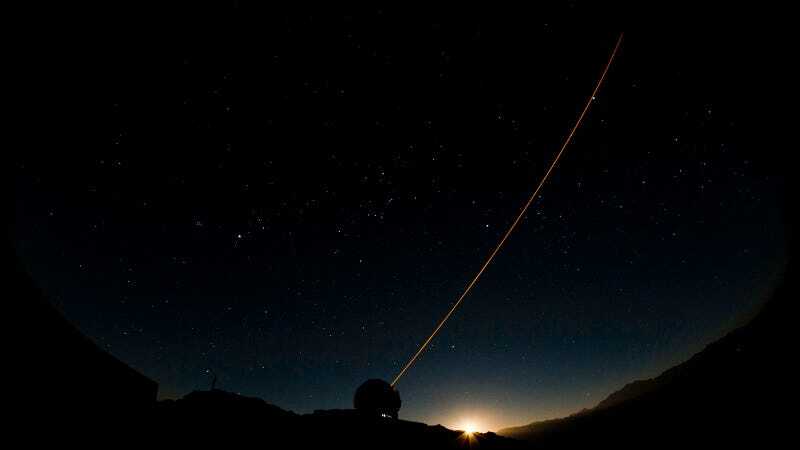 So instead, the GeMS blasts solid-state sodium lasers into the night sky to act as artificial reference points, sampling the amount of atmospheric distortion 500-1000 times a second. The system then generates a 3D model of the turbulence and adjusts its mirrors to negate the atmospheric effects in real time. This allows the Gemini South telescope to image an area of sky 16 times larger than conventional adaptive optic telescopes while generating crisp, clear images and minimizing the cone effect that has long plagued LSG systems. "It's a great feeling to see this system on the sky and doing cutting-edge science," said former Gemini scientist and GeMS inventor, François Rigaut. "When it's all theoretical you dream of what it will someday do to improve our vision of the cosmos. An image like this makes it so real - it's worth all the mental sweat!"